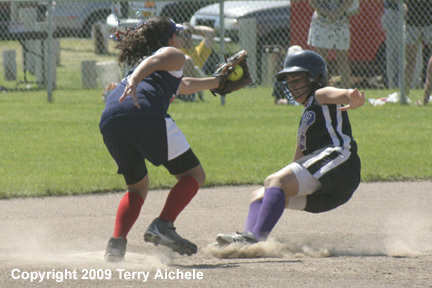 HERMISTON - The Hermiston 11/12 year old Little League softball team defeated Columbia 30-7 on Wednesday, June 29, 2009 in a two and one half hour game. Columbia ran into pitching problems during the game that led to some long innings and Hermiston was able to fill the bases and score a lot of runs. Hermiston started scoring in the bottom of the first when Kalene Wheeler scored from third following a walk and stealing second and third. Wheeler scored on a steal at home to give Hermiston the 1-0 lead. 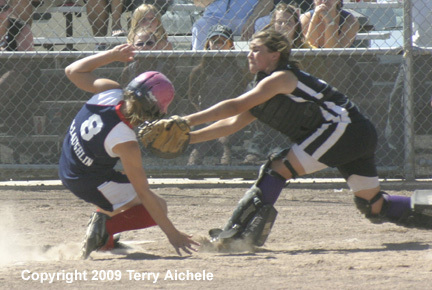 Dayna Horn then walked and made her say to third by steals. Horn scored on a pass ball to give Hermiston the 2-0 lead. Marissa Crowe got on base with a hit down the thirdbase line. Then firstbaseman Makenzie Juul hit directly to Columbia pitcher and made it safely to first scoring Crowe from third for the 3-0 lead. 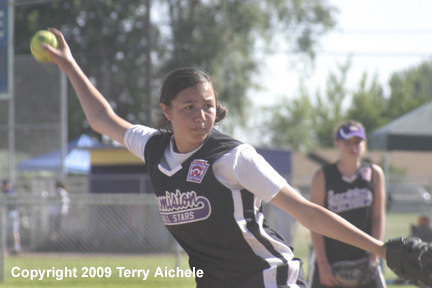 Hermiston had the bases loaded when Amanda Pollick was hit by a pitch forcing in Juul. Then Elizabeth Weems stole home on a wild pitch making it 5-0. Dayna Horn hit a powerful shot to centerfield bringing in Jaycee Barron and Pollick and giving Hermiston the 7-0 lead. Saige Smith then stole home on a wild pitch. Hermiston led at the end of the inning 8-0. Things looked up for Columbia in the top of the second. Two walks and a base hit filled the bases. Left handed batter Gabrielle Ganvoa then hit to centerfield driving in a runner to make the score 8-1. A walk then filled the bases again for Columbia. Two walks forced in 2 runners for a 8-3. Then a shot to centerfield drove in two runs to make the score 8-5. Then a runner stole home to make the score 8-6. Columbia proved that they get into the game after being down by eight runs. Hermiston scored two runs in the bottom of the second making the score 10-6. The bottom of the third was a tough one for Columbia pitchers as Hermiston scored 20 runs in the 50 minute half inning. Hermiston led by a score of 30-6. Columbia was able to load the bases in the top of the forth and score a run but they would have had to score 15 runs for the game to continue. A groundout secondbase to firstbase finished out the game that Hermiston won 30=7.